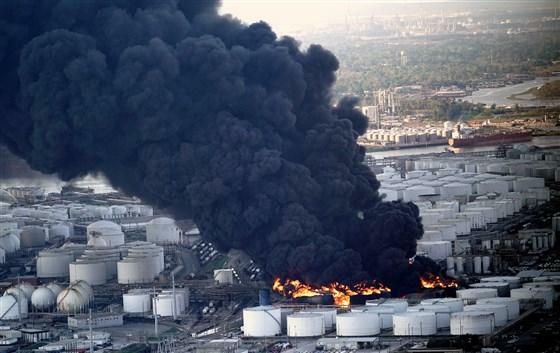 "Officials told KHOU that the substance that was burning was gasoline." Areas are being told to 'shelter in place', people are advised to avoid going outside if at all possible. Air monitoring is being conducted. I wonder what kind of air monitoring they're doing. If they're doing routine air monitoring for criteria pollutants, they'll miss the toxics. But no agency I know of ever does - or indeed can - monitor for the very most deadly toxics except carbon monoxide (a carbon with one oxygen, chemically designated as CO.) I'd be very curious to find out what specifically they're looking for. Luke Metzger, executive director of the environmental advocacy group Environment Texas, said concerns about naphtha were justified. "If people were exposed to the chemical, it could irritate and burn their throat and eyes and cause headaches, dizziness, nausea and vomiting," Metzger said. "Long-term, it could cause cancer and risk to the kidneys and the nervous system. So, it's nasty stuff." He recommended long term monitoring for health impacts of the chemical fire, citing a joint-effort by Texas health agencies, Rice University and the Environmental Defense Fund to collect data after Hurricane Harvey. "Given the chemical in question, given that the fire has continued for hours and that officials thought a shelter-in-place warning was necessary, that makes me think that a study is warranted to study the health impacts," he said. "As well as strong enforcement action to hold the company accountable for endangering the community." CARCINOGENICITY: Benzene has been identified by the EPA and IARC as a human carcinogen. Gasoline mixtures are listed as a possible carcinogen by IARC and NIOSH. Risk of cancer depends on duration and level of exposure. So make sure you never go to a 'self-serve' gas station. Rates of leukemia, particularly acute myeloid leukemia (AML), have been found to be higher in studies of workers exposed to high levels of benzene, such as those in the chemical, shoemaking, and oil refining industries. There's no need to worry about long-term monitoring- Houston is part of the EPA's toxics monitoring program. I was very specifically wondering about short-term 'incident response' monitoring. Originally it looked like only 1 storage tank was on fire, and the estimate was that the fire would be brought under control. Now it looks like several are on fire and it's still listed as out of control. Originally when I looked at the first photo, it took me a LONG time to interpret what I was seeing. The tank that was on fire was so ginormous that I thought it was a fire in some sort of sump or line because it stretched from one side of the photo to another. Then I latched on to a feature (I think it was a ladder) which made me realize that the fire was coming out from the top rim and from the bottom of a fixed-roof storage tank that was at least 5X the size of the other storage tanks around it. They could measure for benzene and "soot" using a nephelometer, or some of the fancier particle-counting technologies. I don't know about Texas-refined gasoline, in CA benzene has been required to be virtually eliminated (to less than 50 ppm) but it could still be allowed in oher states, so maybe present as a toxin. The news video embedded in a ZH article said that 3 tanks were steadily on fire and 3 tanks were intermittently on fire. Yep, it's a mess. A steadily-increasing one. Maybe they need to bring some forest-fire-fighting helicopters and just bomb the area with retardant. The situation seems beyond the resources tasked to fix it. Since 10a.m. Tuesday, two more tanks caught fire and two re-ignited. One tank burned out. Bringing that to a total of eight tanks burning, which is three more than before.